Aisha Yesufu, co-convener of BringBackOurGirls, BBOG, advocacy group on Wednesday made fresh claims on why Boko Haram abducted some students of Government Girls Science Technical College in Dapchi, Yobe State. Yesufu claimed that the abduction of the girls was a move aimed at paving the way for President Muhammadu Buhari’s approval of $1billion to purchase equipment for the fight against Boko Haram insurgency. Buhari had earlier today, Wednesday approved the sum for the fight against insurgency. 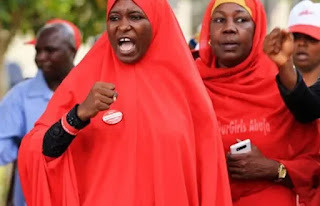 In a tweet, the activist, insisted that the abduction, release and refusal of Boko Haram to free Leah Sharibu was scripted. She tweeted, “Dear Nigerian Citizens, this is what the recent heightened attacks by insurgents and killings have been about. “This is why Dapchi happened. This is why Leah Sharibu is still in captivity. This is why parents had to lose 5 daughters. All for some to make money.